You will lose videos on your iPhone due to all kinds of possible situations, like accidental deletion, virus attack, update failure, device stolen, etc. Good thing is that you have in advance backed up iPhone videos to iTunes, which make data recovery easier to deal with. Want to know how? 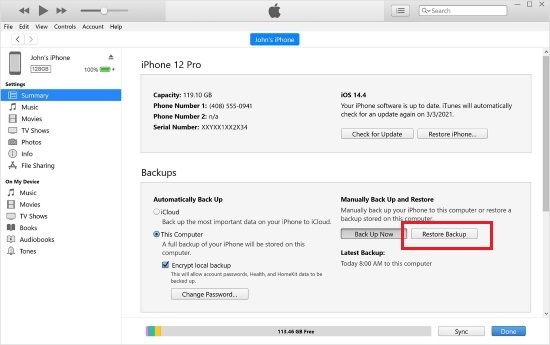 Just keep your eyes on this guide: recover videos from iPhone backup (iTunes). Step 3: Have a close look at all your iTunes backups to select the most needed one; press the "Restore" button to recover the whole backup file. Note: It's obvious that undeleting iPhone videos from iTunes backup using the first solution here is thoroughly forthright. Nevertheless, what is not convenient enough is that you have no access to preview videos before recovery and have to wait until the entire backup file is restored. The previous data on iPhone will be replaced by the iTunes backup as well. Much better than aforementioned solution, Joyoshare iPhone Data Recovery shows relatively flexible data recovery retrieval service for you. 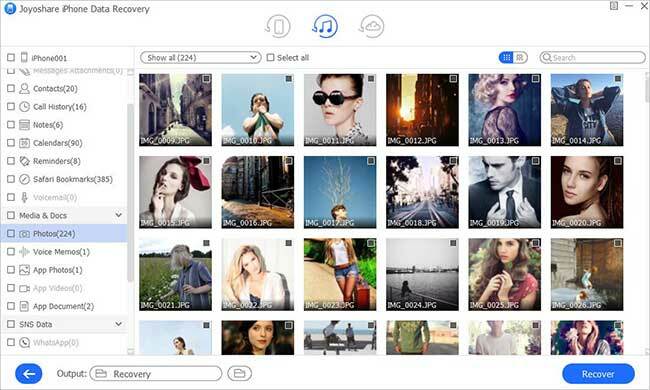 It gives you the right to choose the videos you want, allows you to preview each file in real time and protects current data on iPhone from being damaged or overwritten. In addition, its amazing scanning speed will surprise you as well. Compared to others, this high-efficient software takes up less disk space and will not create unnecessary temporary files again. Furthermore, the hassle-free solution comes with full compatibility to iOS 12 and any model of iPhone/iPad/iPod. With the exception of common data, any of your encrypted iTunes backups can be analyzed and extracted without problems. 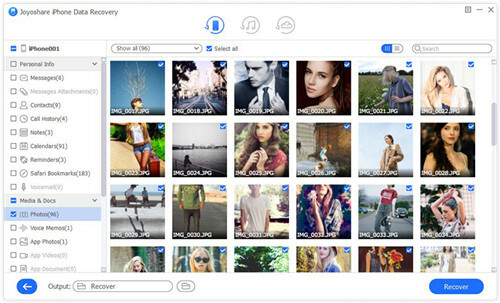 Next you can get down to recovering deleted video from iPhone iTunes backup with the help of Joyoshare iPhone Data Recovery. It is downloadable and installable on both Windows and Mac systems; to guide you clearly, we will only take Windows one as an example. Step 1 Open Joyoshare and select "Recover from iTunes"
Get Joyoshare iPhone iTunes backup extractor started on your computer and straight after change the recovery mode as "Recover from iTunes" on the top navigation bar. 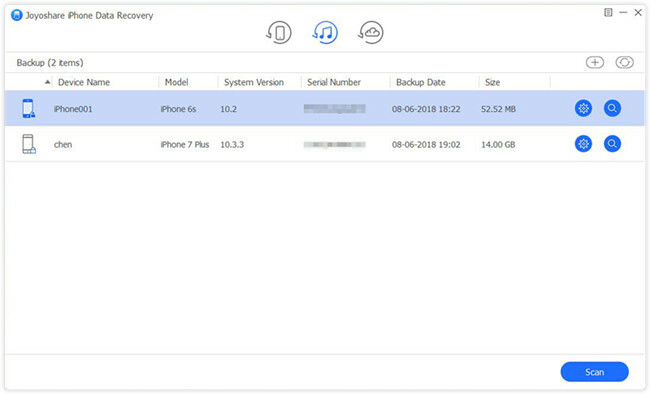 Joyoshare will soon detect and display your created iTunes backups in a list, from where you can get to know device name, model, system version, serial number, backup date and size. Joyoshare also allows you to use its "+" and "Refresh" button to import and refresh iTunes backup in your own way. Then, simply opt for one backup file that has synced the deleted iPhone video and click its "Setting" icon to confirm data type, such as "App videos", "Photos", etc. 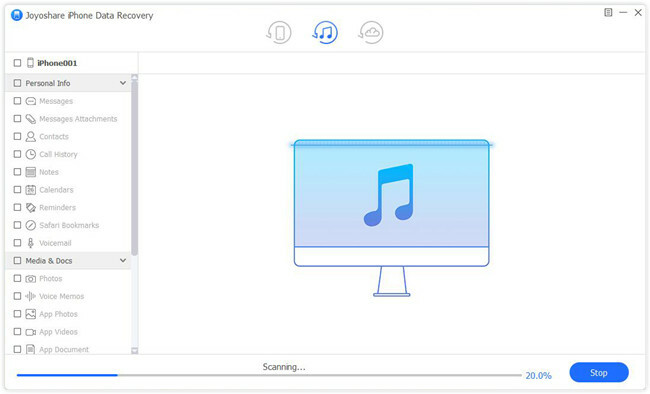 Start to scan backup with "Scan" button. Wait for a while until Joyoshare ends the scanning process. All recoverable contents will be classified in the left column. Go to preview and check the video items you need. Choose "Only show the deleted" to filter out needless files, search file name with search box and mark whatever you would like to recover. Tap on the "Recover" button at the right bottom to save them on computer.